Twitter is different than other social networks and is an extremely valuable marketing tool for all businesses. With over 326 million people using Twitter every month, you can actively reach and connect to your audience and even gain new followers. 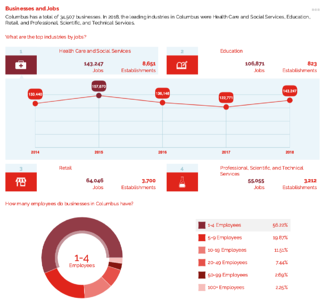 The primary goal of Twitter marketing for economic development is to promote and inform people about your community's value as an investment location, share your GIS tools, show what your website can do, increase brand awareness, and act as a support channel. The time that your tweet is on your followers’ feed is limited. To stay on your followers feeds, you should post 3 to 5 tweets a day to see the most engagement and get noticed. Wednesday is the best day of the week to post on Twitter and the best hours of the day are usually 12pm, 3pm, 5pm and 6pm EST, but it clearly depends on where your region is located and your target audience. 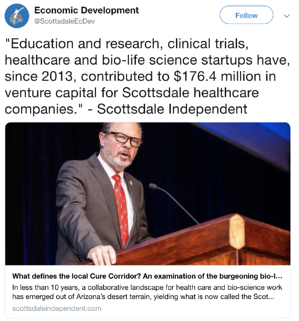 Scottsdale Economic Developments’ Twitter account below is a great example of strong, consistent posts with great content, many of which makes use of economic data from their GIS tools. Humans process visual content faster than they process texts, so tweets with images will attract and generate the most engagement. In fact, tweets with images get twice the level of engagement than text-only tweets. Make your visual posts attention grabbing and vary the type of content. Use high quality images that illustrate and compliment your post. Don't rely solely on promotional posts - turn the attention outward to connect to your audience. Become a resource and give followers more interesting material to consider. A way to make sure that you are posting content consistently is to go back to old tweets. You can retweet old blog articles and infographics, or re-write blog posts with updated statistics, insights and retweet them and draw inspiration from old posts. 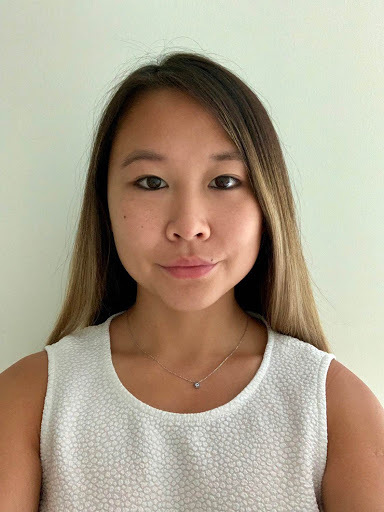 Long blog posts from the past you be divided into smaller posts and tweet it as a “series,” one after the other, within a certain duration such as a day or a week. This will build anticipation for your audience to have to wait and visit your Twitter account to keep updated with the news. You should also leverage your content from different platforms such as LinkedIn and Facebook to publish on Twitter. This is a great method to market your LinkedIn updates to people who haven't seen your Twitter feed. You might even be able to get more followers by republishing. Use relevant hashtags on your Tweets to grow your following and build community awareness. Remember to use relevant hashtags on your posts to get more engagement from your audience and people who are interested and searching the hashtag. Examples of hashtags that you could use would be your community’s hashtag eg. #California #EconomicDevelopmentCA #GISCalifornia or more general hashtags about economic development and GIS #econdev #EconomicDevelopment #EconomicGrowth #OpportunityZones #GISdata. 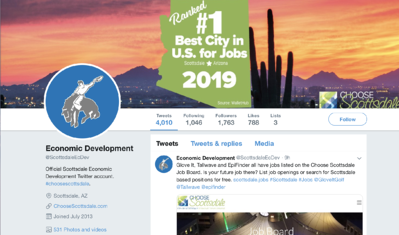 Follow relevant hashtags such as #econdev to stay updated on the topic of economic development and if you see a relevant post that applies to you, interact with that account and re-tweet! Creating your own hashtags allows you to track them over time and see how they have been reused, shared and liked. For example, the City of Abbotsford, BC (@AbbotsfordEcDev) uses #BizFriendlyAbby in many of their tweets. The Greater Sacremento economic Development Council (@SelectSac) uses #selectsacramento and #selectsac in many of their tweets. What creative hashtags has your community come up with? We'd love to see them! Tweet us @GIS Planning to let us know.